When the Olympics flame is lit on July 24 to herald the start of Tokyo 2020, sports fans will be able to see on their mobile devices 360-degree video streams of their favourite sports and athletes and every bead of perspiration on the athletes faces. Or they can “experience” the excitement via virtual reality, almost like being in the stadium watching the exciting opening ceremony even as they are on the Shinkansen bullet trains which are travelling at about 300km per hour. 5G is all about low latency, high throughput and connectivity for billions of devices. This can create a big headache for security professionals. 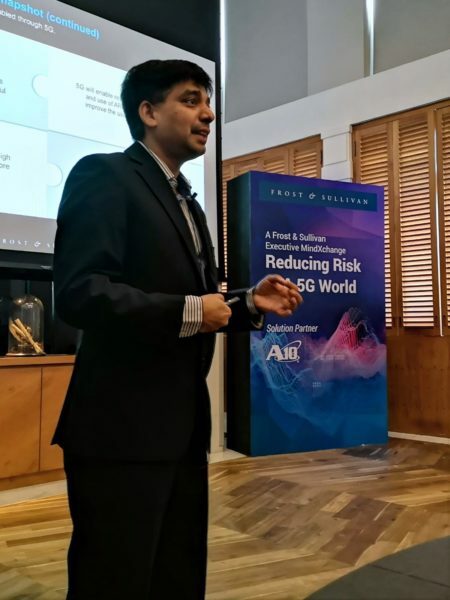 A 5G connected ecosystem will have more devices, connections and data flows linked together, leading to higher security risks, warned Ajay Sundar, vice-president of tech analyst firm Frost and Sullivan. He was speaking at a forum called Reducing Risk in a 5G World, held in Bangkok last week. About 40 participants from the service provider industry from Southeast Asia attended the forum organised by Frost and Sullivan. He highlighted two cyber attacks that may occur from this 5G ecosystem: a distributed denial of service attack and malicious transfers of cryptocurrencies. Sundar explained that with 5G linking a network of devices in homes, organisations or public infrastructure, cyber attackers can enter the network through one of these areas before bombarding the network with data traffic to bring the network to a halt. Or it can use a botnet to break into a system that is mining cryptocurrency and steal the digital money. His advice: centralise all security systems such as those for applications and authentication into one layer. By doing away with disparate security systems, organisations get one overall security view which is less confusing, more efficient and easier to manage. Such a system must include a monitoring and command centre so that if an attack occurs, the situation can be quickly contained and resolved. Earlier this year, A10 introduced a DDoS solution that uses machine learning to automate network monitoring, detection and fast response. Monitoring can be carried out for thousands of devices. It automatically learns about and understand normal traffic patterns and services, hence able to give an alert when an irregular network behaviour occurs. While service providers need to have a laser-focus on 5G security, they have other issues to consider, among them size of storage, revenue and possible applications. Security consultant John Yong, who also spoke at the forum, said telecom operators and service providers have to consider the management of data that 5G traffic will generate. Since 5G can link millions of devices, traffic is expected to go up between 10 times and 100 times. “Industry experts have said 5G will generate 1PB of data. A lot of storage is needed. And 1PB means storage equipment that weighs close to 1 ton. Service providers have to consider this cost as well as whether their data centres can manage this storage size,” he noted. On income streams from 5G, Frost and Sullivan’s Sundar points out that enterprises will ring the cash register for service providers. The combination of speed, responsiveness and reach of 5G will entice enterprises to make use of the technology, he added. Companies in the autonomous vehicle industry where the real-time exchange of data is crucial, would be willing to pay for 5G connection, he noted. -E-retail where real-time loading of images and videos and the use of augmented reality or virtual reality can improve customer experience and boost sales. -In e-brokerage, 5G will enable real-time mobile financial trading and high frequency trading. Speed in this area gives a premium. -In e-payments where QR codes are currently used, there is a two to five second delay when a user taps his credit card on the screen. This is an operational challenge. With 5G, this process is instantaneous which can make the e-payments even smoother.